Find hiking friends for local or international hiking adventures. How prepared are you each time you hike? If you’re like me you’ve gone one too many times without the “10 essentials.” Now I don’t mean you’re one of those people you see on the trail in flipflops…no, you would NEVER do that! But I’ll bet you’ve gone on a hike and said to yourself, I don’t need to bring water or food or that warm jacket in the car – I’ll be back in an hour. I did that once and I’ll never forget it. My friend and I took a spontaneous drive up to the Bristlecone Pine Forest from where I lived in Southern California on an early spring day. It was a long drive and by the time we got there, it was mid-afternoon. What started out as a fun visit to one of our favorite places in the world turned into an experience that rocked my confidence as a hiker. We arrived at the visitors center to find an empty parking lot – the ranger kiosk closed for the season. How cool! We had the place all to ourselves. If you haven’t been to the Bristlecones, you should. It’s one of the most spectacular landscapes in the world. The easy hikes from the Schulman Grove visitors center take you into an ancient forest with trees over 2000 years old. 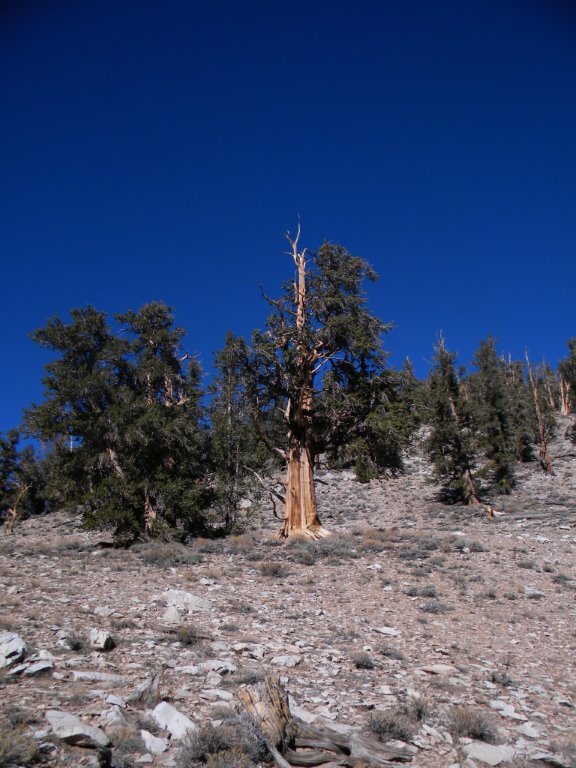 The “Methuselah” tree dates to more than 4,773 years old. At over 11,000 feet of altitude, the forest sits like an island perched between the Nevada desert to the east and Owens Valley and Sierra Mountains to the west. We chose a four-mile hike that started with clear blue skies. We set off in long-sleeved t-shirts and spring pants, two fit and experienced hikers. To us, this was an excursion, not a hike. About halfway through the hike, we came to the top of an escarpment with a beautiful view of Nevada’s Death Valley spread out in the distance over 10,000 feet below. Across the desert at the edge of the next mountain range, a lightning storm was raging. It was breathtakingly gorgeous. However, we could feel the jagged edges of the storm as the wind began to pick up. We’d better hike back fast, we thought. But, no worries, it’s only 2 miles back to the car. Within 15 minutes things had changed rapidly. The storm engulfed us. First with the wind, followed by rain and then lighting. The temperature plummeted. Lightning strikes were coming down all around us – some mere feet away. There was nowhere to hide and so we hiked as fast as we could. But 2 miles can be a very long way in a raging storm. By the time we got back to the car, I was shivering uncontrollably – a sign of hypothermia. Luckily, we had a warm and dry car waiting for us. If the way back had been even another half mile we could’ve ended up with a much different outcome. Since then, I always bring with me the “10 essentials” on every hike. I never want to feel that vulnerable and on the edge again – or stupid. So thank you, Sierra Club, for giving me the 10 Essentials. Number 1 and 2 – map and compass. Most of us rely on our phones, which is fine unless the battery dies (I’m talking to you old smartphone owners). If you’re taking a lot of pictures (and you will because – beautiful) don’t forget that your really good battery could be dead quickly, especially if it’s cold. Learn how to use a map and compass. It may just save your life. Number 3 – flashlight. Just like the above, a lot of us rely on our phones. Nothing burns a phone battery faster than using the flashlight. Use a dedicated standalone flashlight or headlamp (which is what I prefer). Number 4 – extra food and water. This requires a bit of planning. Think high calorie but small volume. Pick high protein bars without a lot of sugar and don’t eat them all during the actual hike but always have extra. Plan for extra water, depending on the season and hike length. I love this water calculator. Number 5 – extra clothing. I had to learn the hard way not to forget this essential. Think about the elevation and terrain and how quickly things can change. I always bring a good wind jacket, a fleece hat, and gloves. Number 8 – firestarter and matches. Believe it or not, and I’ve come close to it, you could get injured and have to spend the night out there. Almost anywhere you would typically hike gets cold at night, even in the summer. Number 9 – sunglasses and sunscreen. Now that I live in Northern Europe it’s rare that I get to see the sun or worry as much about it as when I lived in the Rocky Mountains. But sun blindness and a bad burn can be crippling and deadly. Number 10 – first aid kit. A good wilderness first aid kit can be found in any outdoor store. They come pre-packed in a compact package to fit in a small backpack or Camelback. Put the 10 essentials into a go bag that always comes with you so you don’t have to think about it before each hike and you’ll be set. Here’s to happy and safe hiking! I’d love to hear your stories of being unprepared and lessons learned in the comments. What Makes A Great Hike?